ESA's 35-metre radio antenna in Malargüe, Argentina, has had a major refurbishment. Extenstive modifications made will now allow the ESTRACK network to support future missions like Euclid, launching in 2022, and to transfer data at much higher rates. Upgrades to the ESA Malargüe station, and similar upgrades carried out in the Cebreros station located in Spain in 2017, make a big difference to deep space missions. Currently missions like Gaia are able to send back data at a channel rate of 10Mb/s. Euclid will send back data at a rate of 149Mb/s – a similar increase in speed as we have experienced in our internet browsing in the last 10 years. Euclid, which will orbit at the Lagrange point L2, will be fitted with the 26 GHz band radio giving it a higher bandwidth for transferring data to and from Earth, significantly increasing the scientific information returned over time. 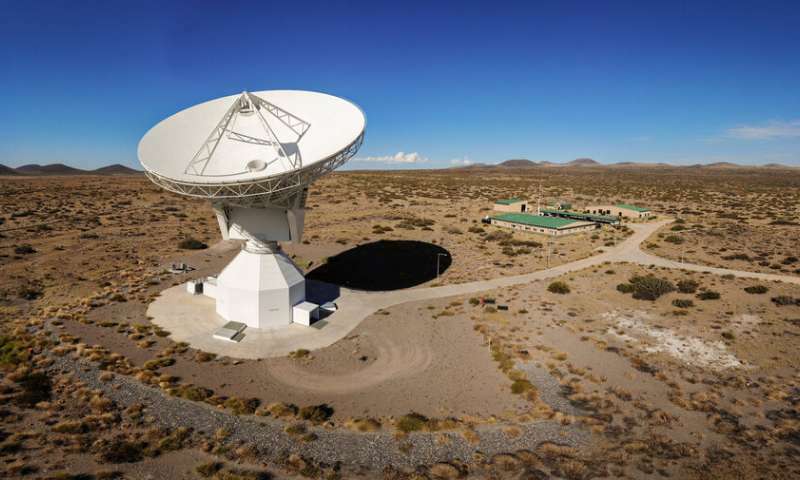 The refurbishment of Cebreros and Malargue stations, will allow ESA deep space antennas to receive broadband signals at 26GHz as well as the conventional X-band frequency. The core of the Malargüe Ground Station antenna optical system is the beamwaveguide. This is a set of mirrors that redirect the signal from the spacecraft to the antenna feeding system. The central mirror in the set plays a key role in the upgrade. By rotating the mirror in the centre, you can redirect the signal to different receivers with different frequencies. When the central mirror is rotated to the deep space position, operators will be able to simultaneously use X-band and Ka-band waves – the kind of signal sent by deep space missions like BepiColombo. When the central mirror is rotated to the near earth position, a newly developed multiband feed system will enable simultaneous X-band and K-band communications. There is a placeholder position for exclusive communication at X-band using the new 80 kW high power amplifier. The 80kW amplifier is currently being developed and is expected to be deployed to ESTRACK by 2024. In addition, a new generation of low-maintenance cryogenic amplifiers for improved performance have been installed, as has the latest portable satellite simulator – which will be compatible with Euclid's high data rates. This upgrade has provided unique challenges for the teams charged with seeing it through. The mirrors must be very precisely aligned, with a maximum of 3.5 millidegrees of angular tolerance. To achieve this precision, photogrammetry was used. ESTRACK antennas also support a very wide range of flying missions, with a high operational load. To minimise the impact on operations, the complete refurbishment had to be completed in only five weeks. The success of the upgrade relied on the dedication and expertise of each individual and their capability to work together effectively as a team. Coordination between more than twenty people carrying out the upgrades has been paramount – and it has been achieved by keeping the team motivation high and ensuring communication and information flowed among the five industrial partner companies who worked together on the refurbishment.